PPB Powdered Peanut Butter Sweetened with Stevia has 70% Less fat than traditional peanut butter, compared to leading supermarket brands. High in Protein and Fibre and Certified Gluten Free. PPB® is so versatile you can use it in baking, smoothies, cooking and of course simply add water to make the perfect peanut butter. Mix 2tbsp of PPB ® with 1tbsp (approx 12g) of water and stir until smooth. Prepare as needed. 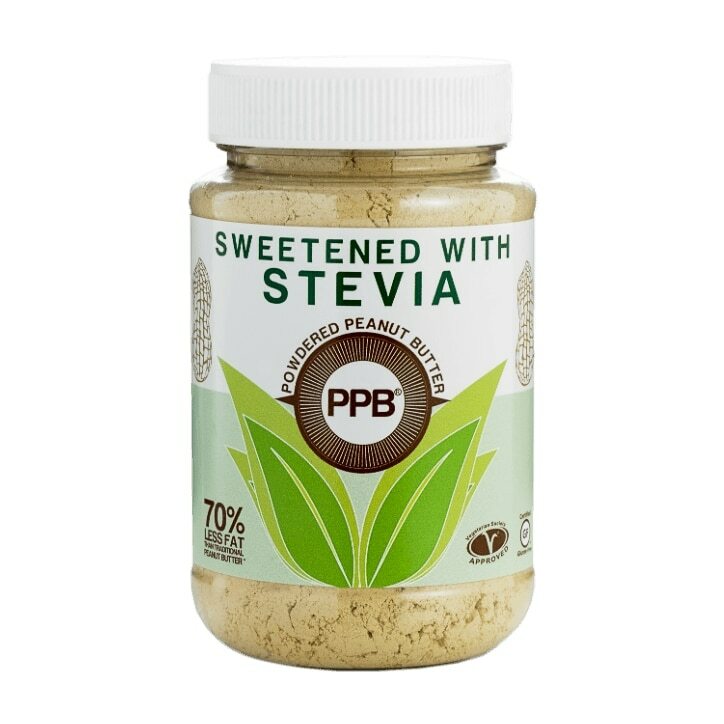 PPB Powdered Peanut Butter Sweetened with Stevia is rated 3.4 out of 5 by 9. Rated 2 out of 5 by S777S from Not a great alternative to pb This is supposed to be a healthier lower in calories version of regular peanut butter, but I personally didn't like the taste of it. I could sense the stevia which gave it an artificial flavour. I prefer to eat normal peanut butter. Rated 2 out of 5 by Yelena from PPB with stevia I prefer unsweetened peanut butter but, bought this to try in baking and smoothies. It's too sweet for my taste to use as straight up peanut butter, as recommended on the box, so I'm using it to make fat bombs and as a dry binder for protein balls. Makes a good buttercream for cakes by reducing the amount of icing sugar needed. If you like regular peanut butter to be sweet, you will like this. If not, it's best to use as a flavour enhancer within other foods like I did. Rated 4 out of 5 by DeguMom from YUM! Try a spoonful of this in your porridge - lovely to add to the flavour, plus you have more protein (and I think the amino acids in peanuts complement the ones in oats so you get a more complete protein profile).